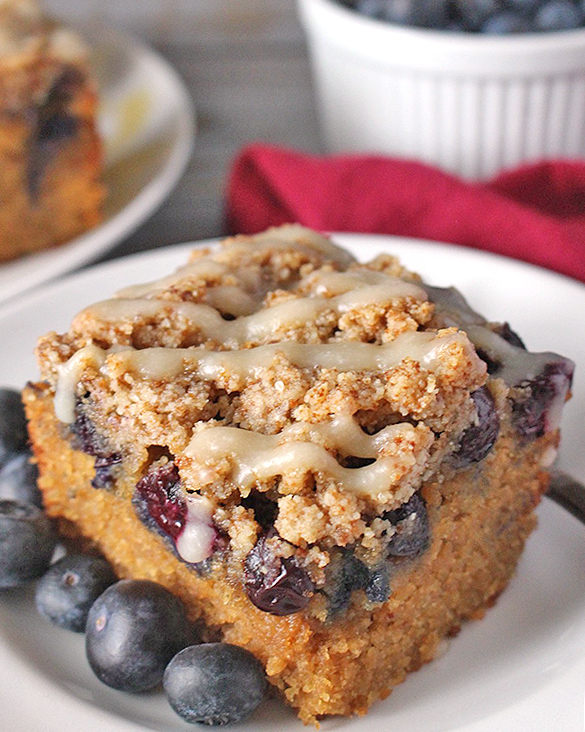 This Paleo Blueberry Coffee Cake is tender, moist, and full of fresh blueberries! 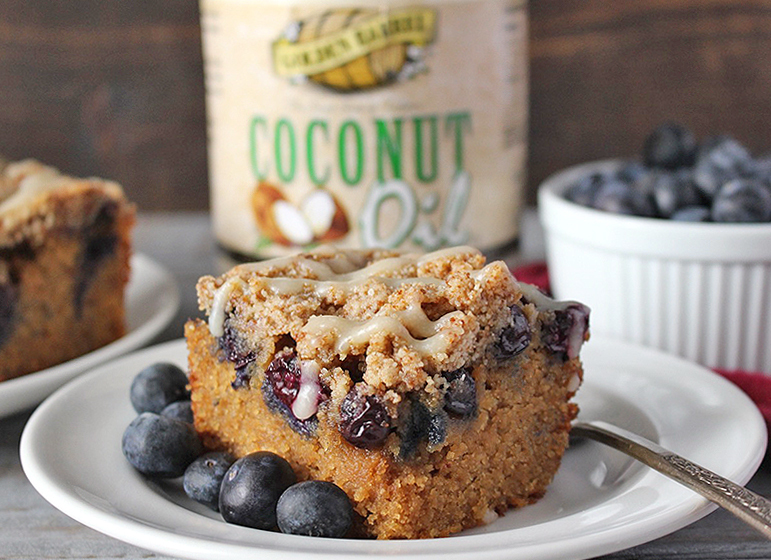 Gluten free, dairy free, and naturally sweetened, but no one will be able to tell! It’s that good! 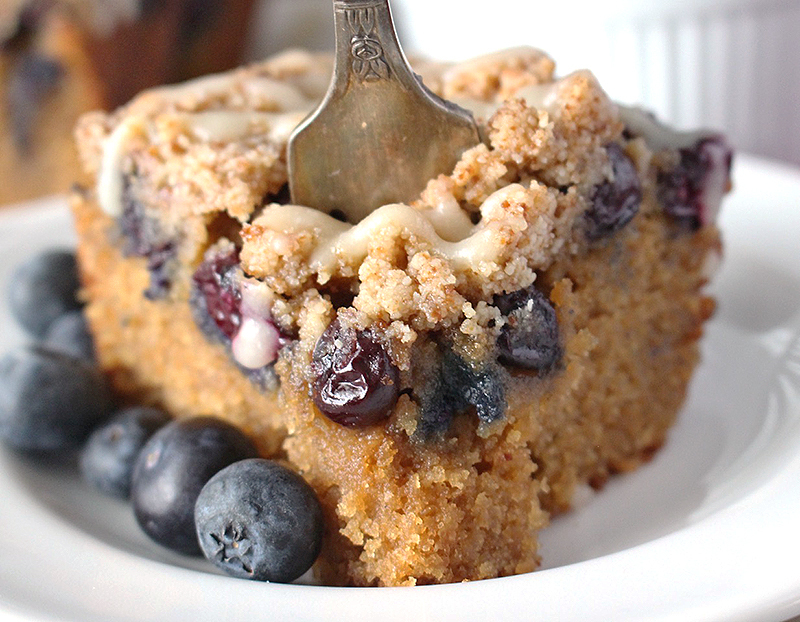 Coffee cake is one of my favorite treats and I have yet to share a spring version. That’s where this blueberry one comes in- each bite is filled with juicy blueberries and a subtle hint of lemon. 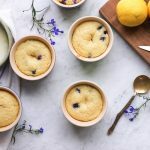 It is so delicious and perfect for a brunch or dessert. Coffee cakes always have a little more prep involved since there are more layers, but I think we can all agree the crumb topping and glaze are worth it. Nothing is difficult about this cake and it comes together by hand- no mixer needed. 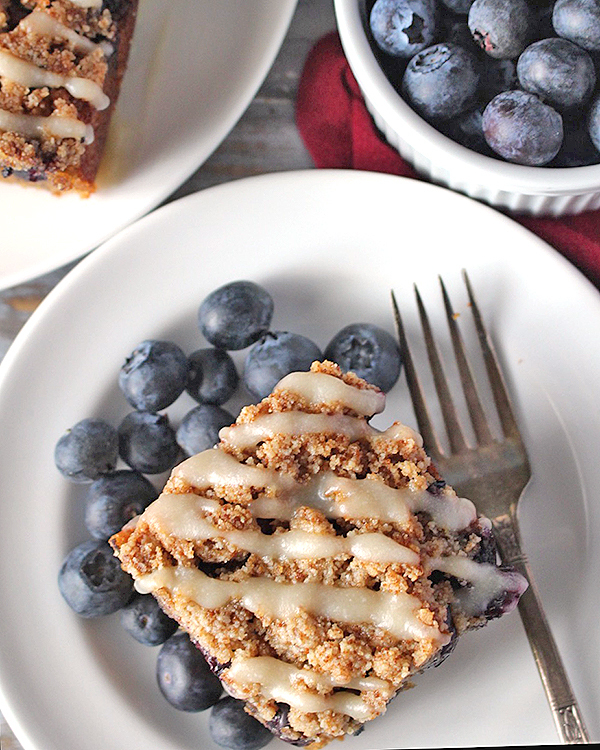 Now a little more about the coffee cake: the cake itself it super moist, the blueberries become sweet and extra juicy, the crumb topping is simple, crunchy and adds nice texture and the glaze adds just the right amount of lemon that pairs perfectly with the blueberries. I decided to put the layer of blueberries on top of the cake instead of mixing them in so they didn’t all sink to the bottom, and that worked perfectly. The ingredient list may look long, but some of them are repeated so it’s not bad at all. If you’re familiar with paleo baking then you probably have all of them already. One small note- coconut butter is different than coconut oil. It is found by the peanut butter in the store and has that thick consistency. If you can’t find it, you can make your own by blending unsweetened coconut shreds in a food processor. 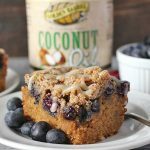 You will love this paleo blueberry coffee cake because it is easy, so delicious, and perfect with a cup of coffee. This would also make a great Mother’s Day treat! Preheat the oven to 325° and line a 9x9 pan with parchment paper. Set aside. Make the crumb topping. In a small shallow bowl, combine the almond flour, coconut sugar and coconut oil until fully mixed and crumbly. I find using my (clean) hands works best for this. Set aside. Make the cake. In a medium bowl combine almond flour, coconut flour, baking soda, baking powder, and salt. Mix well. In a large bowl combine coconut oil and coconut sugar until well mixed. Add in the eggs and mix until smooth. Add in the vanilla, almond milk, and lemon zest and stir to incorporate. Add the dry ingredients to the wet ingredients and mix until to dry spots remain. 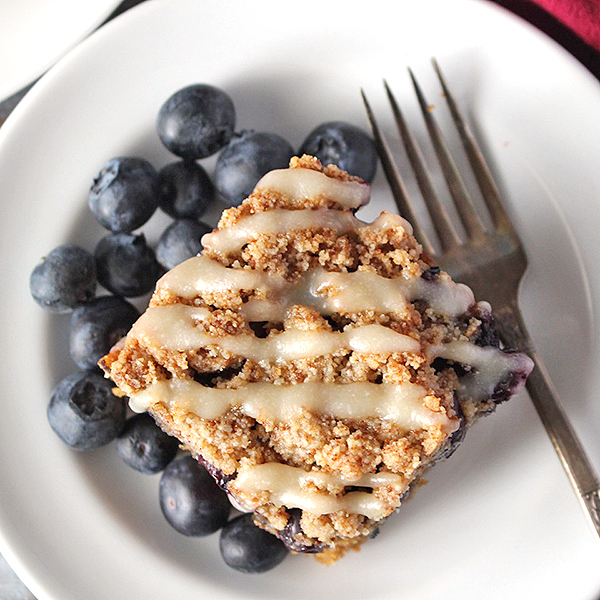 Pour into the prepared pan and top with blueberries. 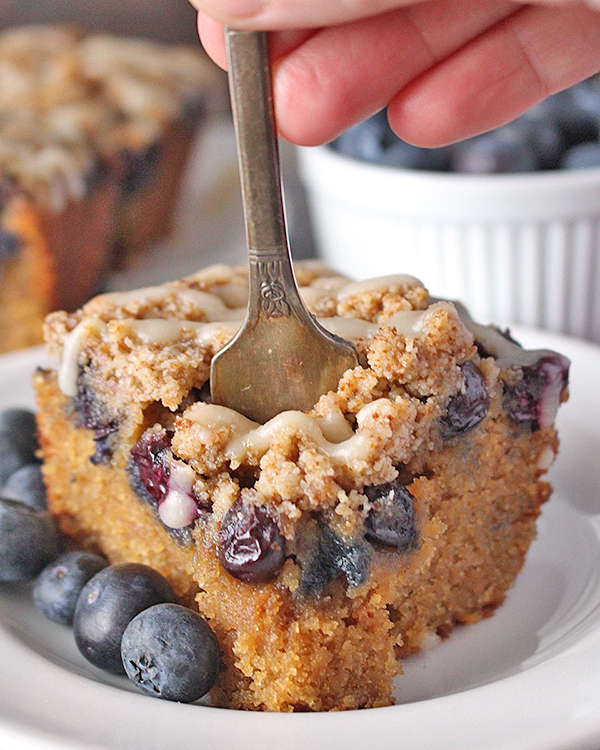 Gently press the blueberries into the cake and then top with crumb mixture. Bake for 40-45 minutes- until toothpick inserted in the center comes out clean. Let cool. Make the glaze. In a small bowl combine the coconut butter, honey, and lemon juice. Mix well. If mixture is too thick, place in microwave for a couple seconds to soften. Drizzle over cooled cake. This looks amazing! Love that it’s gluten and dairy free. Pinning to my breakfast board! Thanks, Rachael! I think you’ll love it! It Is Delicious, however it does not cook through in this time at this temp. I had to add atleast 20 additional minutes cook time to get it to cook firm. But I absolutely love this cake! Hi Pamela- thanks for trying my recipe! I’m glad you liked it 🙂 Every oven is different so I can definitely see how this would take a little longer. I’m glad it came out good for you and thanks for the feedback! 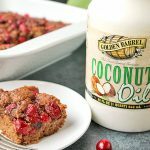 First time baking with almond and coconut products–I’m trying to eat healthy and use better food products! I also had to add a bunch of time to get it the cake to firm up, though–the middle was still pretty liquidy after about 50 minutes! Turned out great though, super tasty and filling! I would like to make this a day ahead of when I need it. How is it to be stored? Hi Anne- in keeps best in the fridge. I hope you enjoy! This was such an awesome (and easy) recipe! It was a hit with my family! And it was beautiful! I’ll certainly make this again! So I made the recipe, it tasted awesome! Not sandy or too granular (typical on how many almond and coconut flour backed items can get). That being said, when I made it, the batter was more of a dough consistency. Is that how it should be? I measured everything correctly, I just found the “batter” to be more like a thick dough that I was able to scoop up and put in pan to bake. Is that right? I wish you had picture posted of each stage to help gauge if you’re doing it right. Thanks for trying my recipe, Nat! I’m so glad you like it! The batter is thick, but it shouldn’t be like cookie dough thick. Maybe add a little more almond milk next time to thin it out. Brands of flour can make a difference. Hope you try it again! Looks amazing and I can’t wait to try it………. but I can’t see any coffee in the ingredients? Thanks, Liz. 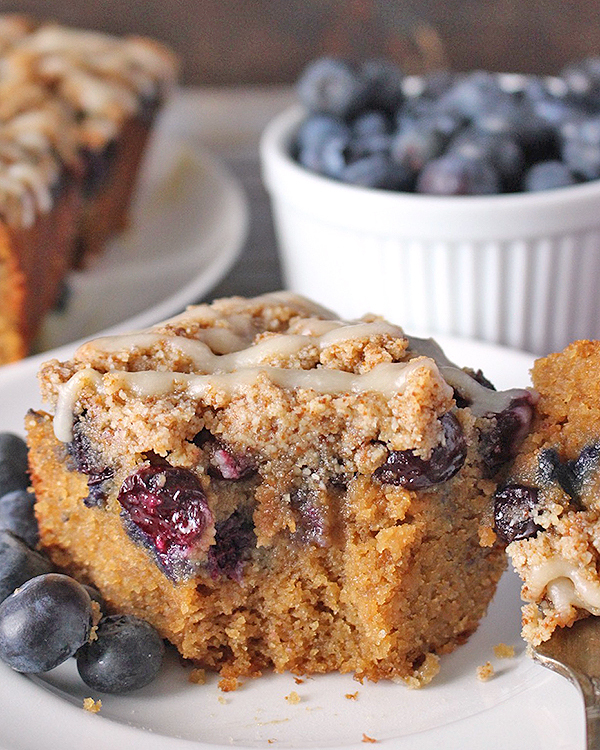 Coffee cake is just cake to enjoy with a cup of coffee. There’s no actual coffee in it. I hope you try it! Lol…… Asked from the UK, where coffee and walnut cake is one of the nation’s favourites! Never heard the term ‘coffee cake’ to mean any cake served with coffee. I made your recipe, and it was AMAZING! I subbed in ground almonds instead of almond flour (v expensive here) and, whilst not strictly Paleo, I used Sukrin Gold (stevia +erythritol) instead of Coconut Sugar to reduce the carbs even further for a diabetic friend. It needed a little longer in the oven, but it was super moist, light, tasty and we enjoyed the leftovers from the fridge the next day. Thank you……This had become a new favourite cake with me! Hi Liz- Oh, okay! Thanks for trying it and I’m so glad you liked it! You did what works for you- I love it! You’re welcome! Ha ha…just realised that in the US any cake can be served with a cup of coffee, hence the name coffee cake but here in the UK coffee cake is, well…..cake tasting of coffee. Hi Patricia- I think adding coffee sounds so good! You are definitely not the first person to ask about that. I hope you enjoy it! I used 1/4 c honey inside the cake and it still turned out tender and light, but had to bake for 50+ minutes (gas oven). The icing really knocked it out of the park! Thanks for trying it, Lisa! Great to know it works with honey. I’m so glad you liked it! Can you substitute regular butter for coconut butter? 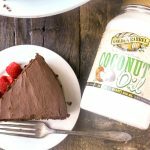 I don’t have coconut butter and wanted to make the cake. Or if not what would you recommend to substitute? Hi Jill- unfortunately no, that won’t work. Coconut butter is more like a nut butter than regular butter. You can definitely make it without the glaze and it’s still so delicious! You can use organic powdered sugar if that’s something you use, to make a glaze. 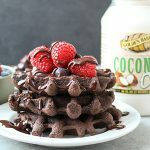 Also, you can make coconut butter by putting unsweetened shredded coconut in a high powdered blender until it’s creamy. Hope those options help! Can frozen blueberries be used? If so, should they be thawed first or used frozen? Also, can maple syrup be used in place of the honey in the glaze? Hi Sue- yes, you can use frozen blueberries and don’t thaw them first. You may have to add a couple minutes to the bake time. Yes, you can use maple syrup. Enjoy!